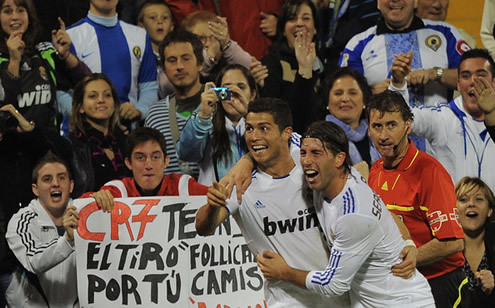 ﻿ Sergio Ramos: "We're lucky to have Cristiano Ronaldo at Real Madrid"
25.10.2011 » Sergio Ramos: "We're lucky to have Cristiano Ronaldo at Real Madrid"
Sergio Ramos is delighted to count with Cristiano Ronaldo in Real Madrid. The former Sevilla defender has been playing as a center back lately, replacing Ricardo Carvalho, but he confessed he has no problems in playing as right defender as well, whenever Mourinho feels it's necessary. Real Madrid recent scoring spree doesn't seem to have an end announced. Sergio Ramos is thrilled about the team's offensive power and praised his teammates for their latest performances. The Spanish defender also commented the brilliant display on the 1st-half against Malaga, sharing the same public opinion as Arbeloa, José Mourinho and Cristiano Ronaldo. Sergio Ramos: "Sometimes it's Benzema, others is Gonzalo Higuaín and in the last match it was time for Cristiano Ronaldo to score. Real Madrid is really lucky to count with such players. ", said the Spanish defender delighted with the way the team keeps scoring goal after goal. Sergio Ramos returned to his original field position as center back in the last weeks, due to Ricardo Carvalho's unavailability and he said he's prepared to play in any position that the team requires: "I feel comfortable playing as center back, but I wouldn't mind returning to right-back whenever the team needs it." Besides Sergio Ramos, Alvaro Arbeloa has also granted his opinion on Real Madrid's performance against Malaga. Arbeloa: "We had an amazing first period. It was one of the best performances we've had so far. However, in the second half we the chance to see how hard it can be to play against Malaga. After the half-time, they returned to the game with a "live or die" attitude, because they had nothing to lose and they took advantage of our permissiveness. We tried to make a possession game, but we have to keep going after goals, since that's the only way we can play well." noted Arbeloa. When analysing exclusively the 1st half, Cristiano Ronaldo has also agreed with his coach and teammates, on the idea that Real Madrid put on a show against Malaga. Ronaldo: "We had such a great collective game and those were most likely our best 45 minutes of the season so far." The Portuguese forward added 3 more goals to his tally, reaching Lionel Messi on the top the "Pichichi" table, but that's not the only reason for him to be delighted. Ronaldo: "I'm happy for my goals, but the real important thing is to win, either I score or not. I don't get worried when I'm not scoring, but rather when Real Madrid doesn't win." Real Madrid will take on Villarreal this Wednesday, for La Liga. You can watch Juventus live stream, Real Madrid vs Villarreal streaming, in our Soccer Live Streams section. The countdown clock timer, displaying the time left for the next Ronaldo game, is shown on the top right corner of all pages. Besides that game, you can also follow the Carling Cup this Tuesday and watch Aldershot vs Manchester United online. In a La Liga fixture, you may watch Granada vs Barcelona live. All streamings are provided from our "Live" section.